It is the colorful market in a mountainous area where the Flower H’mong mainly gathers to exchange their homemade products.This Tuesday market is about 35km from Bac Ha. You can get here via a fairly good road, or by road and river; hotels in Sapa and Bac Ha can organise trips. Coc ly is a small village on the Chay river inhabited by the Flower H’mong Minority people. The Flower H’mong traditionally wear a distinctive and bright coloured costume. 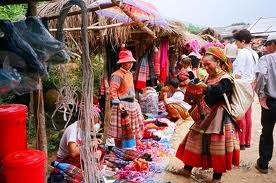 Because Coc Ly is more remote than Sapa, the dress and way of life is more traditional than in the large centers. The market deals in fruit, vegetable, pork and chickens, in addition to colourful fabrics and items of traditional dress. There is a buffalo sale in progress and many of these placid animals are tethered close to the market. 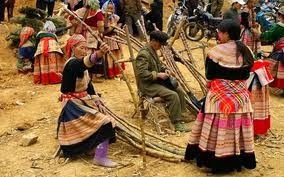 At the crowded hours from 09.00 to 11.00, the market place is dominated by the red and yellow colors from traditional costumes of the Flower H’mong women, dotted with black color of the Black Zao and dark blue from the Tay. The H’mong and Zao from up mountain villages come to the market mainly on foot with their horses carrying their selling while the Tay live along the Chay River use their wooden boats. The best way for tourists is to take the road trip to the market and the boat downstream the Chay River for a few hours to explorea this untouched area. You can see young and old Hmong women, wearing skirts and hats with different types of embroidered flowers, crowding the market during the opening hours of Coc Ly. Scarves, clothes, decorations and other items made of “tho cam” (ethnic fabric) on sale also add color to the bazaar by the Chay River.